The family dynamics in André Téchiné’s Ma Saison Préférée (My Favorite Season) are messy, complicated, and utterly plausible. 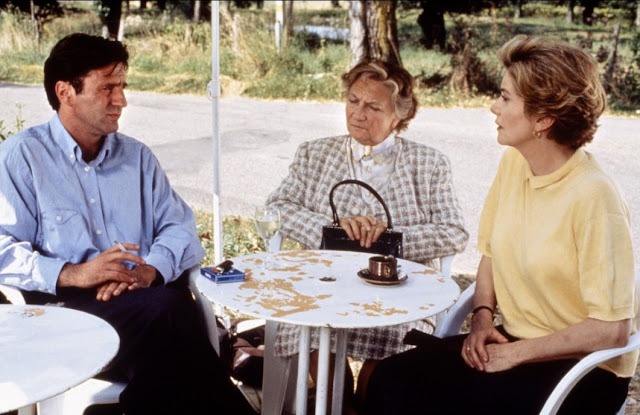 Émilie (Catherine Deneuve) is married to her law partner, Bruno (Jean-Pierre Bouvier); their kids, Anne (Ciara Mastroianni) and Lucien (Anthony Prada), who’s adopted, are grown, though still in residence. 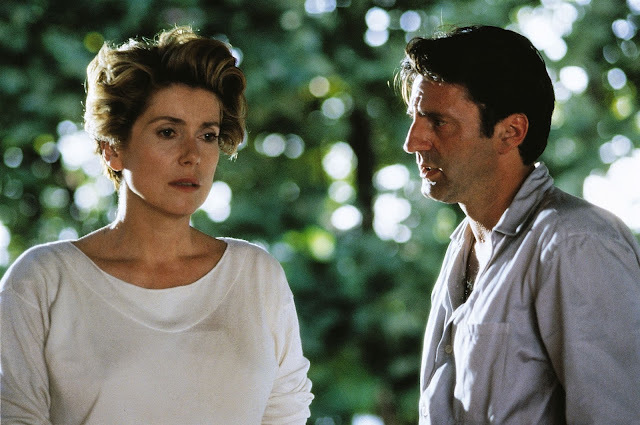 The marriage has become perfunctory, and when Émilie’s estranged younger brother Antoine (Daniel Auteuil), a neurologist in another town, comes back into the picture, he initiates an argument between them that provokes a separation. Antoine has a habit of inciting arguments. He and Émilie have a close, eruptive relationship; at this point they haven’t spoken in three years, but when their mother (Marthe Villalonga) has a stroke and comes to stay with Émilie and Bruno, Émilie seeks Antoine out. The thinking among the members of Émilie’s family is that he’s crazy, and that he gets her acting crazy too; Bruno can’t abide him. So she lies to Bruno that she happened to run into him on the street and invited him to dinner to patch things up between them. Antoine tries to act like the perfect guest and not stir the waters, but he slips and exposes the lie. Bruno’s fury provokes Émilie; she’s so fed up with his disapproval that she says the worst things she can think of to hurt his feelings – she tell him that he suffocates and exhausts her, that she tells him lies to give herself a break from him. It isn’t true, but it does the trick. Téchiné and Pascal Bonitzer, who co-authored the screenplay, are extremely insightful about the way family squabbles begin and the way they look and sound and feel. Ma Saison Préférée is beautifully detailed; it’s also beautifully acted, and the cast seems completely convincing as a family. When Émilie and Antoine get together, you can see exactly why they stopped talking to each other: they’re so thickly bonded that they can wound each other in ways no one else can, and a fight between them inevitably brings an entire history of love and betrayal crashing down on top of them. Once they reconcile, they’re inseparable; when she leaves her husband, Antoine insists on taking her in, reclaiming the intimacy of their childhood years. Téchiné, who has worked with Deneuve on a number of occasions (perhaps most memorably in Scene of the Crime in 1986), was the first director to bring out the humanity in her, perhaps, since Jacques Demy in The Umbrellas of Cherbourg when she was only nineteen – to get inside that glacial glamor – though many others have done it since. Acting for him here, she gets at the ravaging truths about middle age – about being a wife and a mother, a grown-up daughter and a sister – that beauty can’t protect a woman from. And Auteuil’s performance is filled with often humorous grace notes. (Like his mother, Antoine has a habit of talking to himself: when he feels tense in the presence of Émilie and her family, he retires to the bathroom for a smoke, talks out his insecurities, and double-checks his plan of action.) These two actors fall easily and deeply into their sibling roles. As well as Émilie and Antoine, the movie focuses on Mme. Dupuy, their widowed mother, whose declining health and diminished capacities and increasing panic about old age make her tough to handle. We get the sense that she’s never been easy. She can be ornery and critical, and she treats her son and daughter inequitably, hesitating to bother Antoine with her problems (he’s busy, she argues) while she has no such compunction about relying on Émilie. When Antoine shows up at his sister’s for dinner, she takes him aside and complains about every member of Émilie’s family, insisting that she’s unhappy here and begging him to take her away with him. She feels more comfortable with her son, whose temperament is closer to hers, but because he’s as independent-minded as she is, he can’t make room in his life for her. Villalonga gives a remarkable performance as a woman whose plight is as moving as her insensitivity to her children is infuriating. It’s only in the final, difficult section of her performance that the actress stumbles – when a second stroke persuades Antoine and Émilie to put her into a convalescent home, where she deteriorates rapidly. Téchiné’s and Bonitzer’s radar is so finely tuned that whenever it wavers, you notice it immediately. There’s an awkward scene in which a young doctor at the hospital where Antoine works makes a pass at Émilie, and two scenes involving songs are too conceptual and self-conscious – we see too clearly how the songs are meant to comment on the action and the characters. One, a ballad about time passing sung by a woman in a café (Ingrid Caven), would probably work if Téchiné didn’t work so hard to draw out attention to it. (He even goes into slow motion.) It needs a lighter touch, like “Le Tourbillon,” the song Jeanne Moreau sings unforgettably in Jules and Jim, which functions in the same way. The use of the songs is a false step, but it’s not out of keeping with Téchiné’s novelettish approach: through all the illuminating dialogue, you can’t help hearing the screenwriters commenting on the characters and their perceptions of one another. You never feel that the director has the freedom to throw a moment away, to risk it all on the toss of the dice (the way François Truffaut and Moreau throw away “Le Tourbillon”). At the same time, that literary quality is also, aside from the acting, the movie’s greatest strength – what makes it so dense and so satisfying.